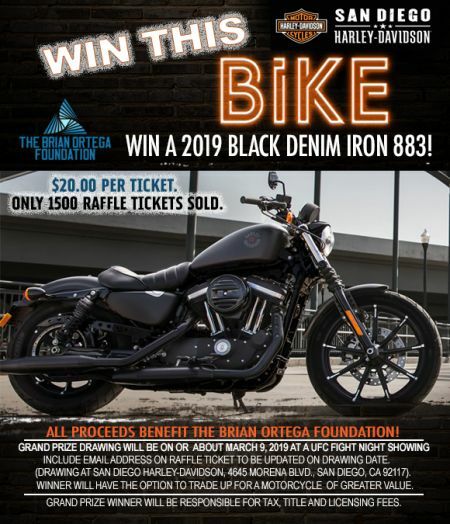 Home › Promotions › WIN THIS 2019 BLACK DENIM IRON 883! WIN THIS 2019 BLACK DENIM IRON 883! All proceeds go to the Brian Ortega Foundation. *Since you are all Friends & Family of Ryan, Harley Davidson and/or the Brian Ortega Foundation, please choose the Friends & Family function. Use the “Add a Note” function to include your Full Name, Email, Phone Number and Zip Code. This information will be used to complete/add your ticket stub into the drawing hopper. It will also be used to text/email a photo of your tickets directly to you. In the event you are the winner and not present at the drawing, we will also use it to contact/notify you. This raffle supports a very important organization called The Brian Ortega Foundation. #1 UFC Featherweight, Brian “T-CITY” Ortega’s Foundation is a compassionate approach to helping others in need. Throughout Brian’s recent UFC success, he has humbly reached back to the community with the goal of helping youth. Based on our friendship and by being inspired by his willingness to help children, we came up with a unique idea to raise money for Brian’s foundation. “Add a Note” function to include your Full Name, Email, Phone Number and Zip Code.